Mytv.ie provides fast and reliable TV wall mounting and removal services. Mounting TV’s on walls is a popular trend in homes, ideally placing LCD TV’s on the wall in the perfect position to view. 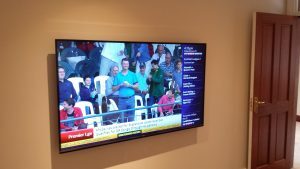 We have years of experience in wall mounting installations of TV’s. We can supply premium and high quality TV wall bracket for any type and size of television.